An amateur photographer who was banned from taking pictures inside a National Trust property, despite rules that allow photography indoors, has exposed an ad hoc approach by managers from one location to another. Earlier this year National Trust bosses bowed to pressure from photographers and allowed amateur photography inside its historic properties – overturning a previous ban. The move had followed a campaign for a change in policy led by a group of photographers via the social networking website Facebook. 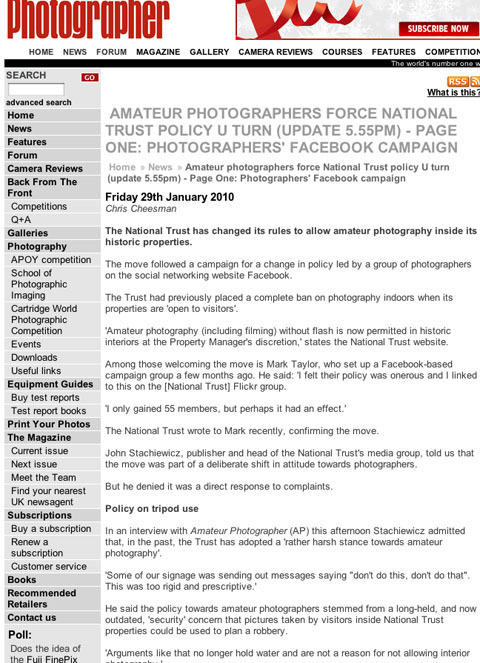 However, National Trust bosses yesterday admitted that its message on when and where amateur photography is allowed indoors has not been adequately communicated to its property managers nationwide. The confession came after Victor Sciberras was stopped from taking pictures by managers at Coletone Fishacre in Kingswear, Devon. Victor had visited the property to photograph its 1920s art deco interior. ?As I entered the main house the lady on the door clocked my DSLR and informed me that photography was not allowed,? said Victor. However, a sign in the entrance lobby had stated that photography indoors was allowed, provided flash was not used. ?I informed her of recent press reports that the National Trust now allowed photography?? he added. ?She told me that she was told that the ?National Trust has changed its mind as it was only a trial period and it decided that letting people photograph inside its buildings did not work??. Victor was then told that photographing the grounds of the property, from inside the building, was also prohibited. ?However, we hope that, increasingly, such information will appear on individual property websites and we might (as of 2012) have some of this information appearing in our Members? Handbook. Stachiewicz said the Trust is ?very much committed to our policy of enabling and encouraging amateur photography?. Stachiewicz pointed out that photography may be banned or restricted where, for example, a collection on show does not belong to the Trust; where copyright may still apply to photographs or paintings; or where a manager feels that photography would cause a ?bottleneck? and spoil the enjoyment for others. But Victor felt let down: ?I love art deco and was hoping to take a few images and turn them into monochromes. As you can imagine I was very disappointed. ?